PayPal may have revolutionised online payments but a new money transfer service is set to make the process even easier - simply by sending an email. Square Cash, part of San Francisco-based company Square - lets users send up to $250 (£154) a week to any email address, on any email provider without the need to sign up and manage an account each time. It is completely free to send or receive payments with Square Cash regardless of the size of the transaction. Once a credit or debit card is linked to an address the first time, a user can send money simply by typing the recipient name into the 'To' field, copying in Square Cash, and typing the amount in the Subject line. Enter at least $1.00 in the subject line. For example: "$10. 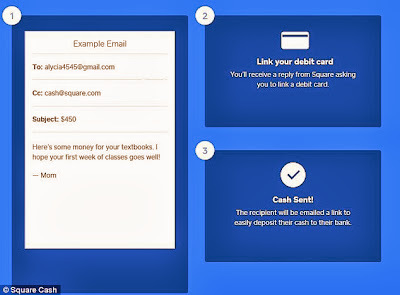 Add a note in the email body to inform the recipient of the purpose for the payment. If you haven’t sent or received Square Cash before, you will be prompted to link a debit card. 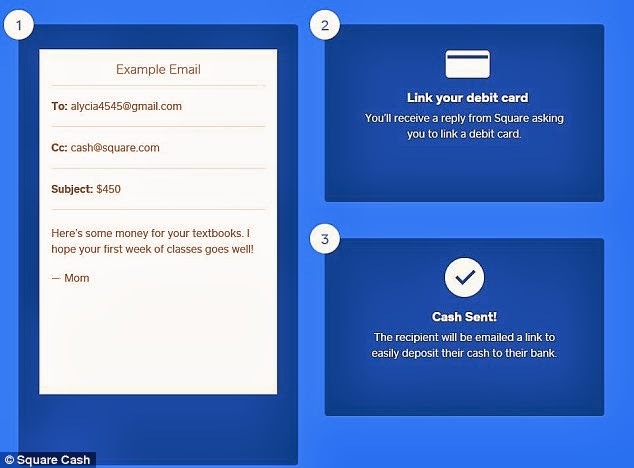 Once added, your cash will be sent and you'll see the "Cash Sent" confirmation screen. You can also use square cash using your phone by downloading square cash app. Download the Square Cash app from the iTunes App Store or Google Play. The app is compatible with most iOS devices running 6.0 or higher and Google Android devices running 4.0 or higher. If you haven’t sent or received Square Cash before, you will be prompted to link a debit card. Once added, your cash will be sent. You'll get an email receipt each time you send Square Cash. You have the ability to cancel the payment by clicking the "Check Status" link within the confirmation email you receive. You can only cancel a payment if it hasn't yet been redeemed by your recipient. If your recipient has already linked a debit card to Square Cash, you will not be able to cancel the payment. Keep in mind that you might see a pending charge on your card statement after canceling a payment. It will drop off after a few business days.